UT-630 serial device servers are designed to make your industrial serial devices Internet ready instantly. The compact size of UT-630 device servers makes them the ideal choice for connecting your RS-232 or RS-422/485 serial devices—such as PLCs, meters, and sensors—to an IP-based Ethernet LAN, making it possible for your software to access serial devices anywhere over a local LAN or the Internet. UT-630 serial device servers ensure the compatibility of network software that uses a standard network API (Winsock or BSD Sockets) by providing TCP Server Mode, TCP Client Mode, and UDP Mode. And using UTEK’s virtual COM drivers, software that works with COM ports can be set up to work over a TCP/IP network in no time. This excellent feature preserves your software investment and lets you enjoy the benefits of networking your serial devices instantly. UT-630 serial device servers support automatic IP configuration protocols (DHCP, BOOTP) and manual configuration via UTEK’s web browser console. Both methods ensure quick and effective installation. UT-630 support special design for PPPoE + DDNS that could let your device to connect to Internet without static IP address. 1 Network interface: IEEE 802.3 10/100M interface. 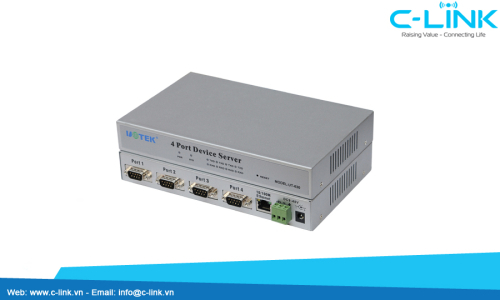 2 Serial interface: 4-port RS-232 interface. 3 Serial interface rate: 1,200-230.4KBPS. 4 Data stream control: XON/XOFF or RTS/CTS. 7 Transmission media: twisted-pair cable or shielded cable. 9 Working environment: -25℃ to 70℃, relative humidity 5% to 95%.